It’s always been possible to mount panniers on road bikes, but it’s never been easy. This is for two reasons: road bike frames rarely have rack mounting points, and road bikes often have short rear ends that cause heel clearance issues with panniers. 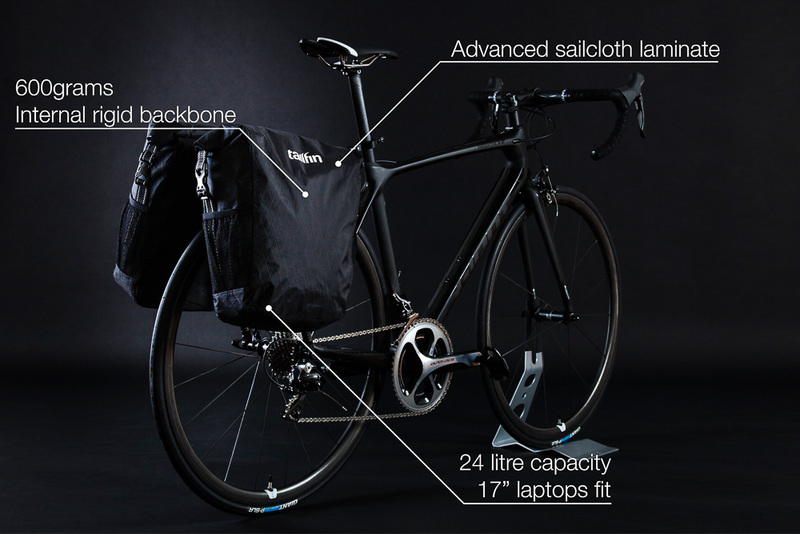 But a company in the UK have decided that lightweight road bikes should be more multipurpose, so they designed a rear rack and pannier system from scratch which is both lightweight and easy to attach to most road bikes. The Tailfin racks installed on road bikes. Tailfin achieved full funding on Kickstarter, smashing their goal and ending up with US $225,000! This clearly demonstrates the strong desire for racks and panniers on road bikes. And I agree, there’s a few great reasons why panniers are good for bike travel: they’re easy to put on/off the bike, they fit all kinds of objects (including laptops) and they’re easy to carry around. The Tailfin Rack will fit most road bikes. The Tailfin rack is super simple. 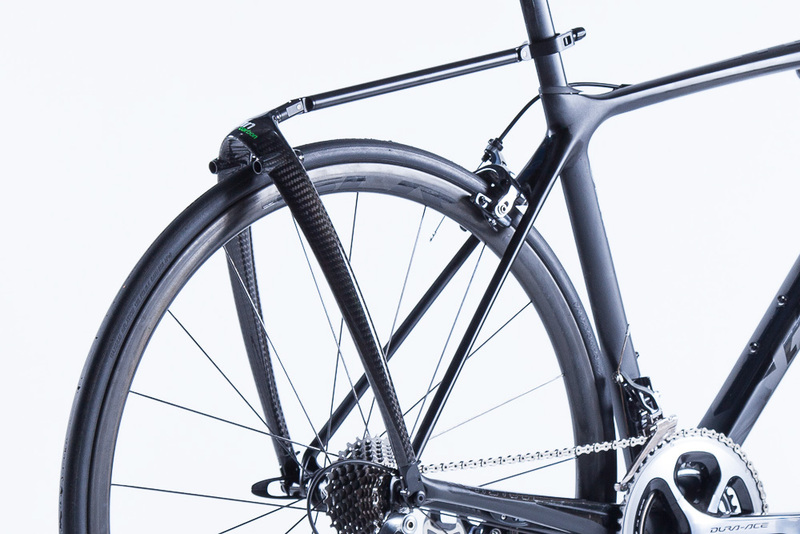 It’s just three parts: a carbon-fibre hooped beam, an aluminium rod and a quick release lever. The lower part of the rack mounts directly to the supplied skewer, and the aluminum rod clamps around the seatpost. The complete racks works out to be about 40% lighter than the next lightest rack, and can still support an 18kg load. 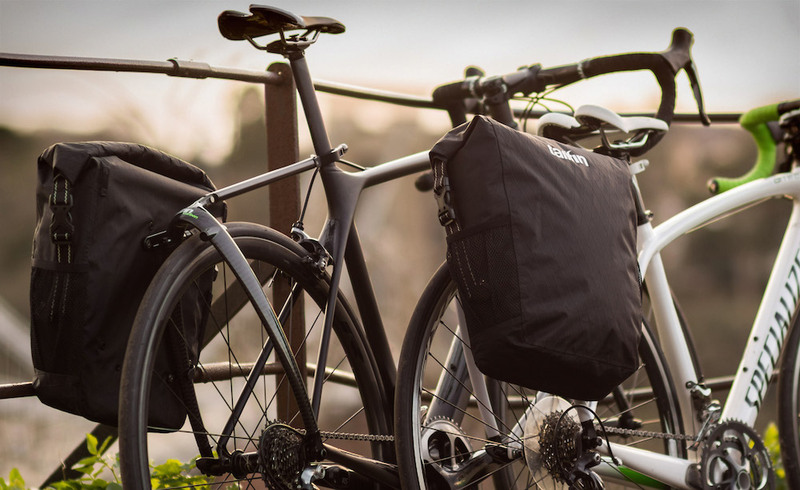 The specially-designed panniers are reinforced with a carbon backbone to ensure that they are structurally rigid on the rack. Tailfin’s panniers are waterproof and durable, offering 24 litres of capacity – generally enough for a light and fast tour. The Tailfin pannier has a carbon reinforced backbone to keep it stable. 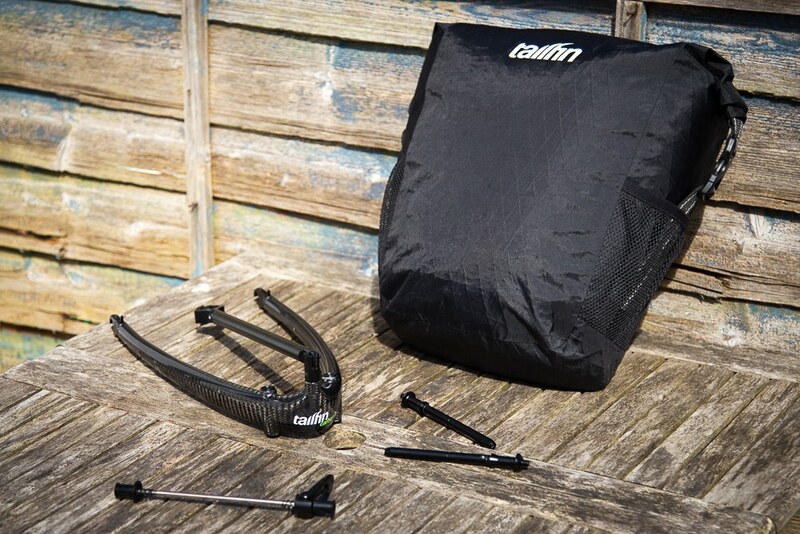 The Tailfin gear is clearly light – bikepacking bag -light, in fact. But when compared to the Axiom/Arkel system it comes out looking pretty expensive. The Tailfin is close to 3x the cost and with only a 100g/4oz weight saving. The price is indeed dictated by the fact it’s all fabricated in the UK. 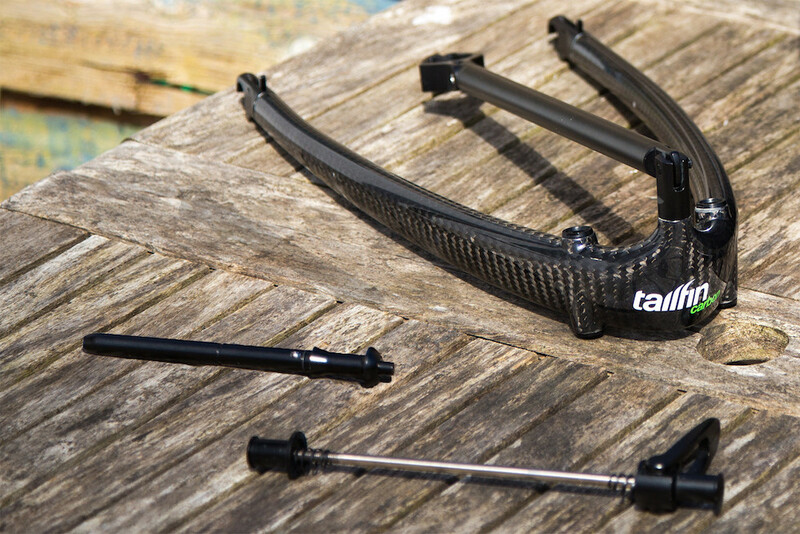 The Tailfin rack still has a few tricks up its sleeve though, including tool-free installation in 10 seconds! That allows you to go between weekend road bike and touring bike in seconds. This is the reason why you’d buy the Tailfin over products half the price. The Tailfin is super simple in its design. – 25-34mm seatposts in all shapes including aero. Tailfin are working on a bigger cloth mount too. – Bikes with standard rack eyelets with the rack mount adapters. – Both 130mm and 135mm quick release axles. The Tailfin Rack setup on a Giant road bike. How Will The Panniers Affect Bike Handling? The downside to mounting panniers to a road bike is that they will affect bike handling, more so than other options (like bikepacking bags). This is due to the location of the weight being both elevated and behind the rear axle. This will result in a somewhat ‘light’ front end when you’re loading more than 7-10kg, but won’t be a problem for light loads. To balance your bikes handling, I’d recommend using a handlebar bag or bikepacking bar bag to better distribute your gear weight. The Tailfin products will be shipping in November 2016. I Recently Tested The Speed Difference Between Bikepacking Bags and Panniers. HERE Are The Results!